Daiwa’s T-wing System solves an age old problem with baitcasting reel levelwind systems. The “T” aperture allos line to flow freely through the wide top section on outcast, reducing the normally sharp angles and friction that slow line flowing through a narrow aperture when exiting the reel. For retrieve, line drops into the narrow, lower channel of the T-wing for even distribution across the spool width. The ideal material for lightweight reels. Lightweight strength and resistance to felxing rival that of Magnesium and will not corrode. Oversized carbon drag washers allow maximum fish stopping power. The spool starts faster and spins longer. As you start a cast, spool’s inductor cup is retracted from the magnets – so there’s no magnetic effect to slow the spool. Start-up is lightning fast.As spool approaches maximum speed, inductor cup automatically moves into the gap between the magnets to apply smooth magnetic braking and prevent overrun. As spool begins to slow, the inductor cup automatically retracts from the magnets – so the spool keeps spinning loger, unhampered by magnetic braking. 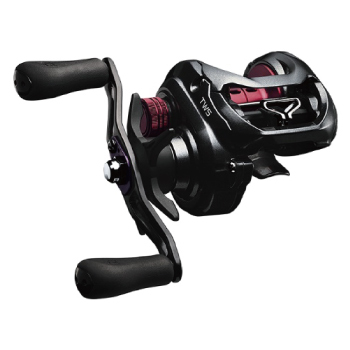 Daiwa’s exclusive swept handle moves the paddles closer to the rod’s conterline. The result is less wobble of the rod and reel in your hand as you crank. That means less wasted energy – a more powerful retrieve.